I am an active member of AOPA Canada (COPA) and I am writing to you to introduce air safari tours offered by our company. Many pilots, and possibly many of your members, are looking for new ways to enjoy flying and for new destinations. In response to this demand, we have developed a number of self-fly tours in Australia. We are also developing tours in Thailand and Canada. We also develop customized tours for groups of 8 or more and would be happy to work with your members to create a unique trip. Could you please tell your members about our website and our tours in your next newsletter or general email communication? Effective from 10/6/2005, Aegean Airlines offers to all members of AOPA Hellas as well as the international members of IAOPA, a fare discount of 15% in all of its available destinations at the moment of reservation. The discount will be in applied in all fares without exception, economy class, business class, even when special offers in effect. Airport taxes and extra charges of any form are not included in the offer. The offer is valid only upon IAOPA Member Card illustration. Reservations, ticket issues, canceling, payments and refunds rely on Aegean Airlines general policy. Please be informed. when presenting your AOPA Crew Card. Prices at local aeroclub airfields are also under 1 Euro (pls check for availability). Why not to fly here? AOPA members will be the first to learn the in-depth details of the much-talked-about-but-never-seen HondaJet, a twin-engine business jet in development by Honda for more than a decade. The unusual airplane is the cover story of the August issue of AOPA Pilot, which is in the mail this week to AOPA members worldwide. AOPA Pilot Editor-in-Chief Tom Haines was given an exclusive interview with the jet's designer, Michimasa Fujino. During the interview, Fujino described the airplane's unique laminar-flow nose, the radical over-the-wing engine mounting system that most others said couldn't be done, and the Honda-developed and patented natural laminar flow wing design. The airplane is powered by a pair of Honda HF-118 engines, which are being certificated under an agreement with General Electric. 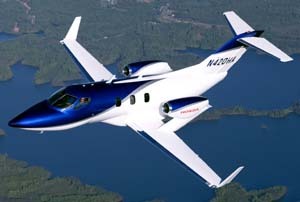 Honda has not yet made a decision to manufacture the HondaJet but may do so within a few months. The airplane is scheduled to make a brief, three-hour visit at Oshkosh next Thursday, July 28. But AOPA members can read all about the airplane�now�online.